Aaron and his sons have been sequestered in preparation for their ordination. This is a onetime event which establishes the priesthood. Lev. 9:1 A burnt offering, a purgation offering, an offering for well being and a meal offering are to be prepared. Note that kashrut is a list of items that should not be eaten but also focuses on the method of preparation. The animals who are precluded are expected to propagate as set forth in Genesis. Note that only male animals may be sacrificed. Purgation refers to the expiation of sin. Yom Kippur atones for sins against God but not your sins against others. This is a narrative in broad strokes and does not bear close examination in some ways. There are many unanswerable questions, some of which arise from difficulties of translation. 9:5 As part of the ceremony Aaron is directed by Moses to make the purgation offering for himself and as a representative of the people. Note that God tried to give the Torah to the Jews on three occasions – first by speaking directly to them, next by writing on stone, and finally via the writing of Commandments by Moses and what we have. It is only the last that was successfully transmitted. The people – for a variety of reasons – could not handle the first two times. 9:8 There are two different types of sacrifice that are described here. CJ: Some of this sacrifice takes place outside of the camp. PG: There is a procession in which what is sacrificed for the burnt offering is shown to the people – probably by Aarons sons. 9:15 The peoples purgation offering, etc. described in detail. PG: The elevation offering is held aloft but not consumed by fire. See Mary Douglas’s insights on this process and meaning of elevation. http://en.wikipedia.org/wiki/Mary_Douglas See also Notes on page 692. 9:22 “Fire came forth before the eternal….And all of the people saw, and shouted, and fell on their faces.” “…before the eternal…” can also be translated as “in front of” but the emphasis is on the fire. The Haftarah for Sh’mini is Second Samuel, Chapter 6, verse 1 to chapter 7, verse 17. He says that every day we must make amends for the tensions and problems of our lives. PG: Conciliation must also be external – that is the role of sacrifice as envisioned here. The classic reform scholars felt that sacrifice must be done correctly – that is with the proper intent. AF We are getting into philosophical areas studied for thousands of years that haven’t been communicated well. We have a dozen people at this table but does the congregation understand this? PG: The sacrificial service was challenged by Jesus – not as to lending money – but as a symbolic act against priestly corruption. Sacrifice was ultimately to be replaced by communal prayer – by liturgy. To some extent that worked as a mode of conciliation. It is a way of dissipating ill will. HF Sacrifice of a prize animal is intended to be a demonstration to the community, LL But what about the sons of Aaron who are themselves incinerated for technical mistakes in making the sacrifices. PG Modern commentaries see this as a punishment for excessive ardor. See Levinas and Heschel’s commentary which suggests they burned from the inside. Another perspective is that they “went off the rails” by calling attention to themselves rather than God. Are you a disciple of Korach or Aaron? As to the Eternal light reference – perpetual fire burning on the altar – is here limited to “all night.” Remember that God’s presence at night is manifest via a pillar of fire and during the day by a cloud of fog. The story is told that an elderly man give his oldest son a beautiful bejeweled goblet. But he warns him always to drink wine from a particular side. The son then forgets which side is correct. His wife points out he must always drink from the side closest to him. To do otherwise would spill the wine. Sometimes the answer is something very simple and fundamental. 6:7 A detailed description of the meal offering for a late afternoon or evening meal. Teleology is the description of the origin of things. The presence here of unleavened bread suggests that there is something problematic with leavened bread. There was a sour dough technique. Pesach has an ancient meaning other than “Passover” It refers to a celebration of spring and spring cleaning and the beginning of the sour dough. We are talking about something that is intended to be intrinsically holy. By introducing the leavening agent one taints that purity or holiness. 6:12 The offering of Aaron and his sons shall be a meal offering but may not be eaten. We are now concerned with the investment of the priests. Aaron’s sons will succeed him in that role. The hereditary notion of priesthood is dominant in the post biblical period. But this affinity became Levitical and then passes to the people of Nazareth. The sacrifices that they need to offer cannot be eaten by anyone. 6:17 The ritual of the purgation offering. What is being purged is contaminants and especially blood. EL: The specifics and detail here are a bit much. PG Remember that this is all taking place in the enclosed part of the temple. – the Tabernacle. There is a mass psychology of expectation here that is culturally constructed. LL Consider the Japanese tea ceremony. CL This is Zen Buddhism and morphed over time from religion to an indication of hospitality. PG: Ritual is part of many institutions – like all rising when a judge enters the courtroom. LL: Being detailed and precise is a way of elevating the importance of what is being done. PG: In modern life rituals have been simplified. It is like a place setting at a meal which requires that a particular fork or spoon is to be used during the Belle Epoch. Ignorance indicated someone who did not belong. CL: Weren’t the utensils placed in the order of their use? PG: Not entirely or anyone could have picked correctly. But see: http://en.wikipedia.org/wiki/Table_setting AF: But what about when the population grew to a point where it became difficult to come to the Temple. PG: Many of these functions could be performed elsewhere. This is covered in the Book of Deuteronomy but not here in Leviticus. Dr. Joel “Hoffmantaschen.” Glasses by Zoe Peritz Greenman. Photo courtesy of Brianna Erlebacher. Inspired by a couple of 4th graders who invented a Yoshi-taschen and a Hamario to help spread Purim beyond the walls of the synagogue, we invited other students to create their own Purim amalgams. The one judged most creative (over my vehement objections) was Dr. Joel Hoffmantashen, seen to the right. Sixth and Seventh Graders Paint Paper-Mache Haman Dolls. 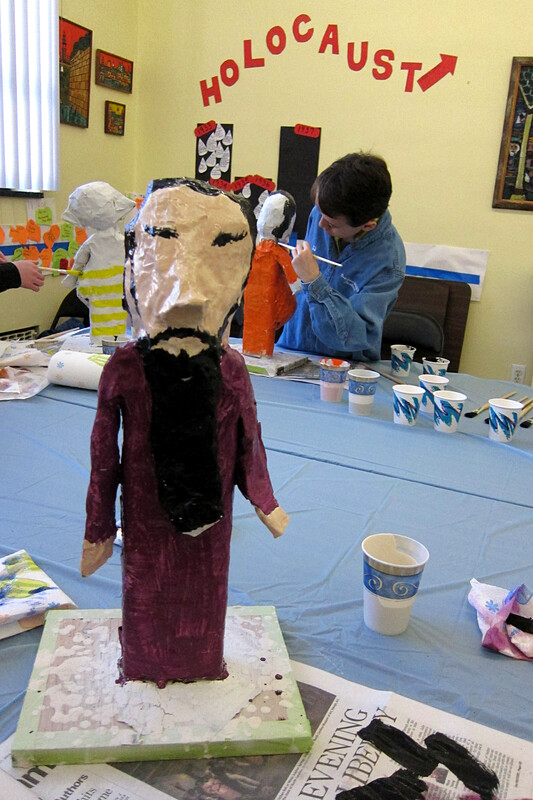 From paper-mache Haman dolls to home-made groggers, students at the Seth A. Erlebacher Religious School have been busy getting ready for the upcoming community-wide Purim carnival and Vassar Temple’s own Purim spiel. Student in Grades 1-3 Create (and Oversee) Haman Cutouts. Dr. Lawrence Hoffman will bring his passion for the spiritual renewal of North American Judaism to our local area, as scholar-in-residence at a shabbaton co-hosted by Vassar Temple and Temple Beth El on Friday and Saturday May 9-10. During the shabbaton we will have three opportunities to hear Rabbi Hoffman speak, and to explore the possibilities for a vital evolving Judaism in the 21st century. Friday night May 9, during the 7:30pm shabbat service at Vassar Temple, Dr. Hoffman will speak on “Builders, Baby-Boomers and Beyond: Looking for American Jewish Identity.” Many believe that the American synagogue is in crisis. But before looking at where we go from here, we have to ask how we got where we are. Dr. Hoffman will help us develop an understanding of how American synagogues evolved, in order to gain insight into how our synagogues can be transformed to meet the needs of the next generation. The evening will conclude with an oneg shabbat featuring refreshments and an opportunity to socialize with one another and to meet Dr. Hoffman. The following morning, May 10 at 10am, during shabbat services held at Temple Beth El, Dr. Hoffman will talk about “Authentic Jewish Spirituality—Even for Skeptics Who Think There Isn’t Any.” Americans love to say, “I’m spiritual but not religious.” But there is an authentic Jewish spirituality, and it runs deep through Jewish texts and practice, constituting a distinctively Jewish way of being in the world. Dr. Hoffman will explain how thoughtful Jewish spirituality can connect the dots in our lives and convince us that we matter. What will Judaism become as people search for meaning and community in the 21st century? The world is changing faster than anyone could have imagined a generation ago. And Judaism has always had its revolutions, from the split into denominations to today’s profound changes in the American Jewish community, such as rising intermarriage and dimming ethnic memory. The assumptions of the past just don’t hold true anymore. We will explore these issues when Dr .Hoffman discusses “Limits, Truth, and Meaning- What’s Left of Judaism When all the Givens Fail” at the kiddush luncheon that follows the service at 12:30pm. This will be the concluding event of what promises to be an unforgettable, inspiring shabbaton. Dr. Lawrence Hoffman is widely recognized as a prominent scholar and visionary He was ordained as a rabbi in 1959, and since 1973 has taught liturgy, ritual and spirituality, theology, contemporary Jewish thought, synagogue leadership, and sacred music at Hebrew Union College – Jewish Institute of Religion in NYC, becoming an often cited authority in all his fields. In 1994, Dr. Hoffman co-founded Synagogue 2000, a project that envisioned the ideal synagogue as the moral and spiritual center for the 21st century. And now, as Synagogue 3000, it has launched “ Next Dor”, a national initiative to engage Generation X and Generation Y through strong community connections with transformed synagogues at the center. Dr. Hoffman has written or edited over forty books, received two National Jewish Book Awards, and his articles, both popular and scholarly, have appeared in eight languages and on four continents. The joint shabbaton on May 9-10 in Poughkeepsie, at which Dr. Hoffman will speak, is free and open to the community. Anyone planning to attend the kiddush luncheon is asked to please RSVP to Temple Beth El at programs@tbeny.org . For more information about the event visit www.vassartemple.org, and for further information about Dr. Lawrence Hoffman go to http://huc.edu/directory/lawrence-hoffman . The conclusion of the book of Exodus. Israel may initially have been a designated geographic area – but not a people. It was occupied by a variety of tribes – petty kingdoms and some nomads. They were united by David and began to develop common cultural affinities and language. 38: 24 The weight of gold and silver suggests a very affluent society. SF: This reinforces the notion that everyone would participate in building the Tabernacle by the contribution of a shekel – a weight or unit of measure. It is not a coin. PG: Note that the text should not be read chronologically. Again “There is no before or after in the Torah.” See the footnotes on the number of shekels in a talent and the calculation of the number of people involved as contributors – 601,730 men. Note the anachronistic reference to “sanctuary weight” prior to the building of the sanctuary per the text but actually a known quantity when this was written. An elevation offering is a sacrifice to God so these metals have somehow sanctified by the action of the priest. . SF: What is the purpose of all of this? 38:29 The new information here is about the specific amounts. This is the first time we are given a number of the Israelites – male over the age of twenty not including the Levites. DC: So this is all to convey a sense of a glorious past. PG: But the past is also prologue – a marker signifying our aspirations. SF: And this supplies the code for achieving prosperity and a just society via reverence to God. PG: Remember that tribes imply divisions – how are these divisions to be resolved? One mode is via a strong leader. The other mode of resolution is via negotiation and concession. LL: There is a third system – having pre-existing, agreed upon laws that set the framework for dispute resolution. HF: But some laws themselves are unjust. SF: We were fortunate in the founding of this country to have had a common set of values based on classical learning and the bible. Those foundations established the ground for the laws and systems that could be agreed upon. LL: As distilled through the Enlightenment.